NOTE: This is a Region-A Blu-Ray which requires a region free Blu-Ray player. With this debut feature, Sofia Coppola announced her singular vision, exploring the aesthetics of femininity while illuminating the interior lives of young women. 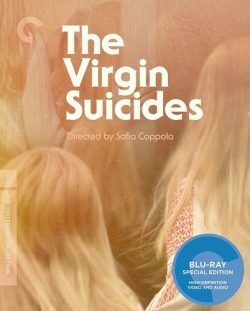 An adaptation of Jeffrey Eugenides’s popular first novel, The Virgin Suicidesconjures the ineffable melancholy of teenage longing and ennui in its story of the suicides of the five Lisbon sisters, stifled by the rules of their overprotective religious parents—as told through the collective memory of a group of men who were boys at the time and still yearn to understand what happened. Evoking its 1970s suburban setting through ethereal cinematography by Ed Lachman and an atmospheric score by Air, the film secured a place for its director in the landscape of American independent cinema and has become a coming-of-age touchstone.